One of the best remedies to a tiring day is to have some “me time” at home, and the best organic cotton sheets will help you rest easier. You can find them at Satara Home & Baby! We carry a collection of fine, non toxic, and beautiful organic sheets and pillowcases for every mattress from toddler to king. You don’t have to worry about sleepless nights anymore. Wrap yourself in the best organic cotton sheets today! Experience the benefits of sleeping in the best organic cotton sheets. We promote healthy slumber through all of our green, organic bedding sets. Our bedclothes are crafted with pure wool, organic cotton, or natural latex. They will help minimize your exposure to toxic and harmful chemicals. What Makes The Best Products? Hand-feel and thread count aren’t the only factors you should consider when purchasing sheets. At Satara Home & Baby, we care about you. This is why we are proud to provide the best organic cotton sheets. Every new sheet has a label with necessary information such as thread count, care instructions, and fiber content. However, manufacturers don’t usually print the numerous chemicals used to produce the sheets. These substances can adversely affect your health. Instead of risking your well-being by continuing to use conventional bedding, switch to the best organic cotton sheets made by Satara Home & Baby! Avoid sheets with care labels that say “Easy Care,” “Permanent Press,” or “Wrinkle-Free.” These sheets have been processed with formaldehyde resin, a chemical fabric finish that doesn’t wash out. These are definitely not the best organic cotton sheets. Do not buy synthetic fiber sheets. Some materials, like polyester microfiber, are created through many intensive manufacturing and dyeing processes. Global Organic Textile Standard (GOTS)-certified sheets are the way to go. GOTS is an organization that works hard to ensure that no dangerous chemicals are used in processing fiber into fabric. With the help of GOTS, you can feel safe knowing that the fibers in the best organic cotton sheets are purely natural. Double-check linens labeled with “organic cotton.” Not all of these sheets are certified organic, and some may have been processed with toxic chemicals. Purchase the best organic cotton sheets that are certified according to OEKO-TEX Standard 100. OEKO-TEX screens finished textile products to see if any harmful substances are present. However, its tests don’t determine if the fiber was grown organically or incorporated into the fabric through other organic methods. Buy the best organic cotton sheets that have been sustainably produced. Some sheets are labeled “non-toxic” but aren’t certified chemical-free. Linen (flax) sheets are good examples of manufacturing through sustainable methods. Even the best organic cotton sheets can’t cover up broken innersprings and sagging spots in worn-out mattresses. In addition, conventional memory foam mattresses are often treated with toxic flame retardants and other man-made chemicals. The aforementioned companies have been providing organic and all-natural mattresses for years. They have established a solid reputation for exceptional workmanship and superior goods. Since the market is always bursting with new companies that offer the best organic cotton sheets, we will definitely keep our eyes peeled for them. Let us work hand-in-hand to make the world a better place and ensure that our homes are natural, sustainable, and eco-friendly. Replacing your conventional bedding with the best organic cotton sheets is a great way to start. You can also help save the environment by promoting how beneficial it is to use the best organic cotton sheets. Infants are very prone to the negative effects of chemical substances. To keep your children safe, Satara Home & Baby also offers a line of natural and organic baby products. Satara Home & Baby is your one-stop shop for the best organic cotton sheets. Our all-natural sheets are designed to nurture your health and keep your bed safe for you and your loved ones. Coyuchi Organic Cotton 300 TC Percale Sheets Even if it's summer time, you can snuggle up in the best organic cotton sheets comfortably. Coyuchi’s 300 TC organic cotton percale sheets are perfect for those Sunday mornings when you just want to snuggle up in bed and let the day go by. Coyuchi Organic Cotton Flannel Sheets Coyuchi produces the best organic cotton sheets. These flannel sheets are brushed on both sides to create a sumptuously soft texture. Coyuchi Organic Cotton Sateen Sheets Coyuchi’s organic cotton sateen sheets have a thread count of 300, making them feel velvety smooth and warm. A unique weaving technique was used to make these sheets naturally resistant to wrinkles. You can enjoy a comforting feeling when you lie down on them. Gotcha Covered Organic Sheet Set - Fits up to 11" Mattress This organic sateen sheet has a lustrous and soft feel since it's made of long staple Egyptian cotton. Thanks to Gotcha Covered, you can bring home a GOTS-certified organic cotton sheet. It also fits a mattress that measures up to 11". Gotcha Covered Organic Sheet Set - Fits up to 18" Mattress This organic cotton sateen sheet fits a mattress that is 18" thick. 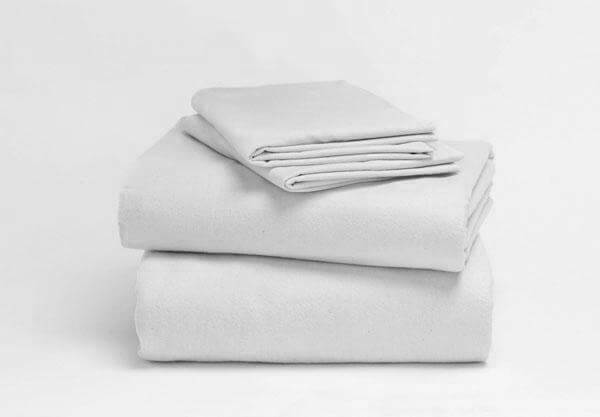 It’s made with certified organic Egyptian cotton, resulting in a buttery soft and lustrous hand-feel. Coyuchi Organic Jersey Sheet Set If you want stretchy and soft sheets, you can’t go wrong with the Coyuchi Organic Jersey Sheet Set. The fabric used to make this set is GOTS-certified cotton jersey that feels smooth and silky. Each sheet set is inclusive of a flat sheet, two envelope pillowcases (one for a twin size), and a fitted sheet. You may request additional pillowcases to pair with more of the best organic cotton sheets. Each product comes in different styles, sizes, and colors. If you’re looking to buy best organic cotton sheets for winter or summer, you can find them at our store. You can buy two organic sheet sets: one for you and one for your loved one. That way, you’re also keeping an eye out for your family and friends. Let them know that you want them to sleep soundly and live healthily, too! Contact Satara Home & Baby to order the best organic cotton sheets or see our store. We have a store located at 6333 University Avenue, Middleton, WI. Visit our store to take a peek at and buy from our available selection! We offer more than just the best organic cotton sheets. For feedback or inquiries, call us at (608) 251-4905. For all questions and comments, including those about the best organic cotton sheets, we look forward to hearing from you!